County Players Falls Theatre is currently seeking play and musical suggestions for our 2020/2021 Season (63rd Season). Your input was integral to determine our 62nd season and we appreciate all those who made suggestions to assist the Board in this important process. Our Play Selection Task Force is currently in session and we once again look forward to receiving your feedback. If there are plays or musicals you would like to suggest for our 63rd Season, please send your suggestions to plays@countyplayers.org no later than March 31, 2019. Please include why you think your suggestion would be a good choice for CP. In addition, if you are interested in being considered to direct any of the shows on your suggested list, please indicate your interest, including a time frame for your availability, next to the show titles. 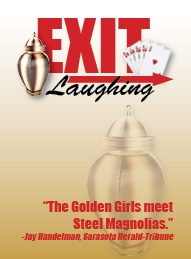 EXIT LAUGHING opens this Friday at 8pm! Purchase your tickets now! When the biggest highlight in your life for the past 30 years has been your weekly bridge night with the “girls,” what do you do when one of your foursome inconveniently dies? If you’re Connie, Leona and Millie, three southern ladies from Birmingham, you do the most daring thing you’ve ever done. You “borrow” the ashes from the funeral home for one last card game, and the wildest, most exciting night of your lives involves a police raid, a stripper and a whole new way of looking at all the fun you can have when you’re truly living. Winner of the AACT NewPlayFest 2014. TONIGHT’S AUDITION FOR THE DROWSY CHAPERONE HAVE BEEN CANCELED DUE TO THE WEATHER. Auditions will be held tomorrow 1/21 at 7pm as scheduled. 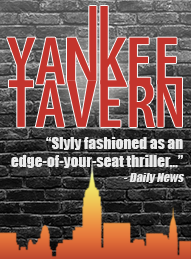 AUDITIONS – Sunday, January 13 for YANKEE TAVERN at 2pm! The second production in our new CP2 Reader’s Theatre program. It’s 2006, people are still dealing with the physical and emotional fallout from 9/11. The “Yankee Tavern” is an old neighborhood joint in lower Manhattan, a place that was hopping in the forties, now doling out its final shots before the crash of the wrecking ball. Adam is the proprietor, his buddy Ray the barkeep. The occasional quiet stranger drops in, but they generally have the place to themselves. The jukebox died on September 11, 2001 at 8:46 am, when the first plane hit the World Trade Center… Ray’s reflexive conspiracy theories drive the conversation, but take on an air of legitimacy as the play unfolds. Performers of all ethnic and racial backgrounds are encouraged to audition. Any questions please contact the director at kitcolbourn@gmail.com.